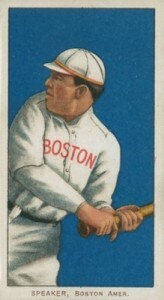 Tris Speaker, a hero of two Boston Red Sox championship teams, was the king of doubles, hitting more two-baggers than any other batter in major league history. Also a near all-time leader in career hits and batting average, Speaker was a monster in centerfield, holding the record for most outfield assists. 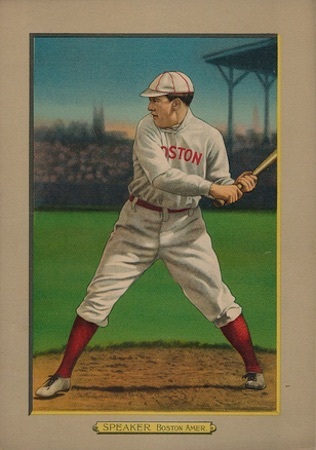 Comprised from his career as a player and manager, this list features some of the best Tris Speaker baseball cards in existence. Speaker's playing career as an amazing contact-hitting center fielder mirrored that of his rival Ty Cobb. Despite this, he lived in Cobb's shadow for most of his active years. Although he had an impressive 3,514 hits and a career .345 batting average, Speaker only claimed one batting title compared to Cobb's 12. After taking the Red Sox to two World Series titles, he also led the Cleveland Indians to their first World Series win as a player-manager in 1920. In 1937, Speaker became a member of the second class to be inducted into the Baseball Hall of Fame. Shop for Professionally Graded Tris Speaker cards on eBay. Outside of the remarkable cards included in this list, there are a few lower-budget Speaker cards worth investigating. Two Topps releases featuring Speaker (and other retired baseball legends) include 1951 Topps Connie Mack's All-Stars and 1963 Bazooka All-Time Greats. Other Speaker appearances of note from the '60s came in the 1960 and 1961 Fleer sets. In addition, 1961 Golden Press Hall of Fame had cards that were originally issued in perforated sheets. Having passed away in 1958, collectors seeking any Tris Speaker autographed memorabilia will mainly need to look for signed baseballs from his playing days. However, bat relic collectors do have many options for Speaker in high-end sets. Several relic card examples can be found in 2002, 2003, and 2011 Topps Tribute. He was also featured in the 2016 Panini Flawless base set where precious gems were incorporated into the card itself. 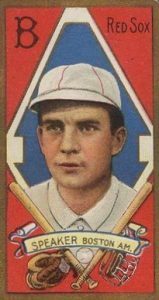 Although the value of Tris Speaker baseball cards from his playing days can't really compete with Ty Cobb, they are still some of the key cards in many of the tobacco era's greatest sets. In determining the placement of each option listed below, card value was the main factor along with historical significance. Many retired baseball legends, including Speaker, are part of the 240-player checklist featured in 1940 Play Ball. He is pictured during his coaching days with the Cleveland Indians when he was player-manager from 1919 to 1926. Cementing his mark, the 1920 World Series win over the Brooklyn Dodgers was the franchise's first championship. This card gives you a hint of Speaker's grey hair which earned him the nickname of "The Grey Eagle." One of the most ornate designs from the 1920s can be found in 1922 E120 American Caramel. The set has come to be known as the "Series of 240" which refers to the checklist size. 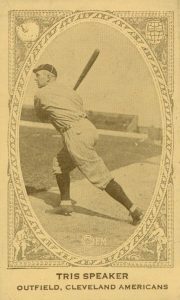 Speaker and other American League players were shown on a cream colored stock with brown ink while National League players have green ink on blueish cardboard. American Caramel also produced card albums that had enough space to hold the complete set for each league. As you might expect, those albums are incredibly rare today. Many of Exhibits Supply Company's photo card releases from the 1920s have very similar designs that are sometimes difficult to differentiate. You might not notice it at first but Speaker's card from the 1927 set has a slight green tint to it which helps in the identification. 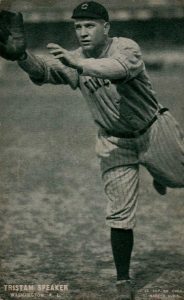 The photo used is probably Speaker's most famous as he awaits a throw with one leg raised, making it look like he was possibly at first base. The image remains very popular and has been used on Speaker base cards in 2014 Panini Classics, 2011 Topps Tribute, 2011 Topps Marquee, and 2010 Topps Triple Threads. The 1910-1911 Sporting Life set features a very robust checklist with nearly 300 cards available to collectors. Spending four cents would get buyers of Sporting Life newspaper a dozen cards and they issued 24 different sets over the course of two years. Some cards were reprinted because of their popularity and there are also several color variations of the Sporting Life advertisements on the reverse side. Speaker's card features a colorized portrait that gives you an idea of the baseball uniforms at that time, including a popped collar. 1914 Cracker Jack is one of the most popular sets of the era and includes players from the American League, National League, and the short-lived Federal League. Speaker's card in the 1914 Cracker Jack set has an identical front to the 1915 card with the only difference being the reverse side was printed upside down in 1915. Examples from 1914 Cracker Jack are worth many times more than the second set. The long T202 Hassan Triple Folders cards could be folded into thirds, making the card look like a cabinet when folded over the black-and-white action photo in the middle. 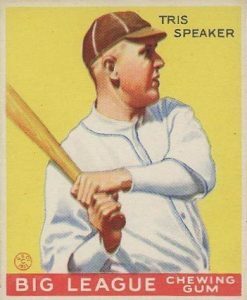 Speaker shares one of his many cards in the set with his longtime teammate "Smoky Joe" Wood who became one of the few pitchers to win more than 30 games in a season. The middle action image, titled "Close at Third," also features Speaker as he slides under the tag of Terry Turner, the third baseman for the Cleveland Indians. The 1910-1911 Turkey Red Cabinets are oversized cards that are almost six inches wide and eight inches tall. Collectors could have some sent to them in exchange for coupons from packs of Turkey Red cigarettes (plus a few other brands). If you were lucky enough to receive a cabinet that had an advertisement for Turkey Red cigarettes on the reserve side, those hold nearly double the value of the backs that feature a set checklist. 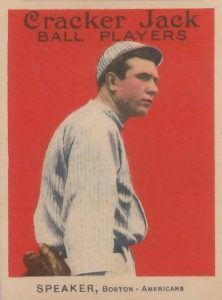 Speaker's card was printed at the beginning of the set's run in 1910 while the players toward the end of the 126-card checklist were produced in 1911. You might notice that the image on Speaker's 1911 T205 Gold Border card is very similar to his image on the Hassan Triple Folders card at #5 on the list. While National League players were featured on a more plain design, American League players had their portrait painting in the middle of a baseball diamond surrounded by a baseball bat and glove. As is usually the case, the most common card backs were for the Piedmont and Sweet Caporal brand of cigarettes. 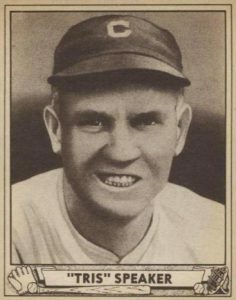 The Tris Speaker card in 1933 Goudey is the only one that comes close to approaching the popularity of the top card on the list. Goudey's first baseball card set remains amazingly popular with collectors as it features nearly every star of the era. Issued shortly after his retirement, the reverse side of the card describes Speaker as one of baseball's "immortal" players as he hit over .300 17 times in his career. He was also the first player to ever record 50 doubles and 50 stolen bases in the same season. The famous T206 set features a unique Speaker image with a dark blue background that seems to show Tris swinging the bat and exiting the left side of the card. At about the time the card was issued, Speaker had the best season of his career, hitting .383 and becoming the American League MVP in 1912. That year also saw him string together three hitting streaks of more than 20 games in the same season. Collectors can expect to pay over $2,000 for mid-grade+ copies of the premiere Speaker card. 2016 PANTHEON D C GU BATS HONUS WAGNER TRIS SPEAKER NAP LAJOIE PAUL WANER 1 1!! 1921 W516-2-1 #6 Tris Speaker "pop 2, NONE Better!" PSA 4 !